Prime Minister Sher Bahadur Deuba may want to take refuge in ‘‘A Christmas Carol’’ after a crushing defeat in the elections. A Christmas Carol, a novella by Charles Dickens, was first published in 1843. In the 174 years since its publication, the novel has never been out of print. It tells the story of Ebenezer Scrooge, a wretched, “grasping, scraping, clutching, covetous old sinner” with a disdain for the spirit of Christmas. On Christmas Eve, Scrooge is haunted by the ghost of his dead business partner who tells him he still has a chance for redemption. Through the course of the night, Scrooge is visited by three spirits who will help him transform into a kinder gentler man. Prime Minister Sher Bahadur Deuba may want to take refuge in A Christmas Carol. After a crushing defeat in the elections, Deuba and Nepali Congress party are in need of a radical transformation. For inspiration, we present him his very own Christmas Carol. Deuba sits pensively at the edge of his sprawling living room next to the large French window that overlooks Kathmandu. Below the city is glistening brightly, like a festive Christmas tree, spread across the valley. There is no load shedding. “Our government ended load shedding, yet the voters reject us. Our government institutionalizes democracy, yet the voters reject us. Ungrateful,” he muses sullenly. The soft click of a door opening behind him interrupts his thoughts. “Join us for dinner, sir.” It is his wife, Arzu Deuba. “Forget the election results. Come dine with us on Christmas eve,” she implores. Thus, he returns to his lonely thoughts of a ruse that can bring the Congress back. It is quiet again briefly before the door is flung open with a booming sound. The noises get louder as it draws closer, clanking as if someone were dragging heavy chains across a wooden floor. 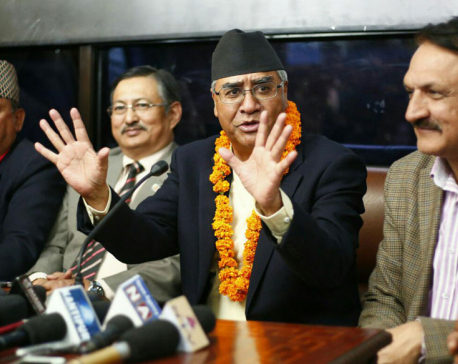 Deuba turns back, training his eyes to the dim lights behind. When in full sight, Deuba shrieks and jumps. “I know him! BP’s Ghost,” before falling back into his chair terrified. The resemblance is unmistakable. The tuft of white on the beard, the square rimmed glasses, the Topi (hat) slightly titled. With that, BP’s Ghost opens the large French window and flies out into the lights of Kathmandu below. Deuba is woken by a waft of cold air blowing from the large French window. The window opens and closes effortlessly as if someone were commanding it do so. “Are you the spirit, sir, whose coming was foretold to me?” Deuba asks. “I am,” replies the spirit. Before he could even see where the spirit stood, Deuba has been magically transported to a spacious living room. (Maoist chief) Prachanda and Deuba are alone, a note pad with a few scribbles on the table between them. “I remember the moment clearly,” Deuba says. It was where he had made the deal with the Maoists to bring down Oli’s UML government. Prachanda and Deuba had shared power, each enjoying nine months as Prime Minister. 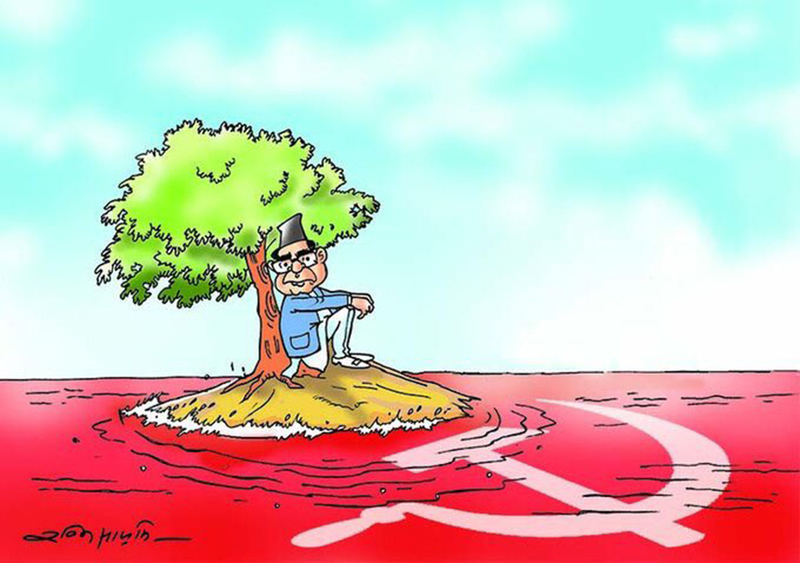 “You can’t partner with Prachanda when it is convenient, only to claim a few months later that Prachanda and the communist coalition are out to destroy democracy,” says the spirit softly. From there, the spirit flies Deuba across the country. They go past homes still in rubble three years after the earthquake. From the sky, they watch people in makeshift camps waiting to rebuild their homes after the flood. They see unbuilt roads and stalled progress. “All that was wanted was the stability of governance,” says the spirit. Deuba wakes startled to a strange voice. “Awake,” exclaims the second spirit. “I am the spirit of present. Come with me.” Deuba follows and is transported to large room full of television screens. “I bring tidings of the elections. Look around. From every corner of the country, the results are not good. You have been beaten. Your party has been decimated,” says the spirit. The spirit says no more. Instead it transports him into the meeting where a deal is being struck, a government position is being sold, a project is being commissioned. There is money everywhere. “What will you do with all this wealth,” asks the spirit. “Make democracy work,” replies Deuba. On the way back, the spirit and Deuba peer into the window of a house with a Congress flag fluttering on the roof. An elderly man has set the newspaper aside and is speaking with his daughter. When the third spirit appears as foretold, Deuba is quick to seek guidance. “Beware them both,” says the spirit. “If you enter the future with ignorance believing this election defeat to be nothing more than the outcome of the communist coalition, there is nothing but doom. If you enter the future with the same expression of selfish want of power, influence and wealth, there is nothing but doom. Reject them both,” advises the spirit with intent. 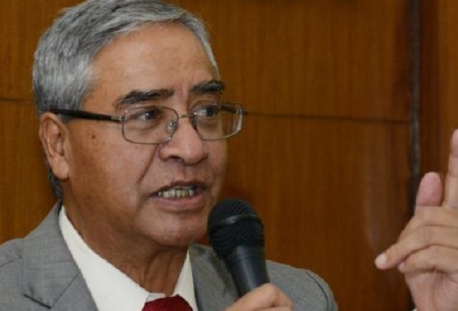 “Is there no other door,” asks Deuba. Dickens had a stave five where Scrooge transformed into a giving, kind man. Deuba and his Congress party will perhaps need more than a few spirits (liquid or otherwise) to determine how they undertake the transformation to be relevant again. It would be a tragic loss if the Nepali Congress, the party that has dedicated its life to fighting for democracy in Nepal, isn’t able to overcome the recent rejection by voters. Nepal needs the Congress party to resurrect itself and thrive.